Sweethearts conversations hearts are a classic Valentine candy. Cute pastel small hearts with sassy little sayings of love. Sweethearts Tiny hearts come in assorted flavors 6 flavors; Pink - Cherry, Yellow - lemon, Orange - Orange, Green - Apple, Purple - Grape, Blue - Blue Raspberry . . These little hearts are not only perfect for handing out, but also are a great way to decorate cup cakes and cakes for your Valentine's Day party. They have also been used for decoration photo frames or using as a boarder around your homemade Valentine Card for that special someone. Each bag is 7 oz. 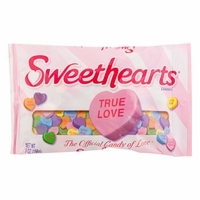 Necco sweetheart brand candy hearts are the number one selling non chocolate candy for Valentines days. Necco produces nearly 8 billion conversation hearts through out the year to keep up with he large demand for Valentine's day. That is about 100,000 pounds a day. Even though these little hearts first came out in the early 1900's they are still loved today by kids of all ages. People all over the world give conversation hearts to their special Valentine. The concept of Sweethearts Conversation Hearts, originally called Motto Hearts, dates back to the late 1800�s when little sayings on colored paper were placed in �Cockles,� small crisp candies formed in the shape of a scalloped shell. In 1866, Daniel Chase, brother of Oliver Chase, who founded NECCO in 1847, invented the process, which allows the sayings to be printed directly on the candy. The modern hearts started in the 1900's. These candies were cut in various shapes, such as postcards, baseballs or horseshoes and embossed with curlicues, the original hearts had room for much longer sayings, enabling would-be lovers to send long messages. Today's conversation hearts have become short, sweet and right to the point. Many companies make conversation hearts, but none of them have the great taste as Necco's sweetheart brand. Over the last 150 years the messages on these hearts may have changed, however the formula has remained basically the same. Actually the same formula is used to make the candy hearts as the Necco wafers. Each year Necco comes out with 10 new sayings for their hearts. New sayings for 2008 are �Melt My Heart,� �In A Fog,� Cloud Nine,� �Heat Wave,� �Sun Shine,� �Get My Drift,��Wild Life,� �Nature Lover,� and �Do Good.� and �Chill Out" Even with all the new sayings over the years you will still find the classic nostalgic ones like "Be Mine", "True Love" "Lover" and "Kiss Me"
These heart shaped candies are available in two sizes the standard tiny heart is about 1/2 inch and the larger ones about 3/4 inch. The tiny hearts can fit no more than two words with no more then four letters each, while the large hearts can fit two words with six letters each. These are the perfect sweet treat for those watching their weight as the tiny hearts have only three calories and the large hears only six, they are also fat-free and sodium-free. These hearts are a big hit at classroom parties as the kids wait to see just who gives them the "Kiss Me" or "Be Mine" hearts. Children will spend hours days before Valentine's Day trying to decide which cute boy or girl will get which heart. You will hear giggles and laughs even see a few faces turn red. Necco brand sweetheart conversation hearts will always be a part of Valentine's Day. As much as a part of your past as it will be your children's. Everyone loves nostalgic candy how many times when you see these hearts to you think back to when you got one from that cute little boy or girl saying "Marry Me"" Kiss Me" or "Lover Boy" and it brings a smile to your face. This is one tradition that will carry on throughout the generations.